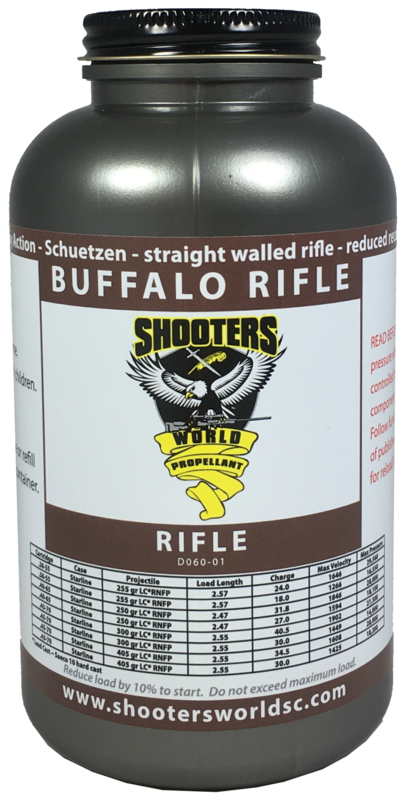 This propellant has a burn rate optimized for straight walled rifle cartridges, as well as reduced recoil/reduced energy loads in virtually all rifle applications. Chambers where the bullet diameter is virtually the same as the internal case diameter, such as .38-55 Winchester, .45-70 Gov’t and numerous Schuetzen calibers, will benefit from Buffalo Rifle. The standard test load for this propellant is .30-06 Springfield, a 168 grain bullet, and ONLY 22 grains of propellant. This loading density is less than 50%! Yet this propellant burns extremely well in this condition. Whether the loader desires to shoot cast lead or standard jacketed bullets, this propellant can greatly expand the utility of a hunting rifle. Now, a .30-06 can be used for plinking with the kids! Or a .243 for rabbit hunting! Safe, reduced loads can be economically loaded and enjoyed by the whole family. The surface of this propellant holds no deterrent or burn rate modifier. Therefore, it ignites quite consistently with low loading densities in standard rifle loads. This same ignition characteristic aids accuracy when used with cast lead bullets and long throated chambers. Despite Buffalo Rifle being an extruded propellant, we have found good flow characteristics through a volumetric powder dump. The grain is narrow, and cut short. While some reloaders insist on weighing each powder charge, we did not find that extra time necessary when loading this propellant. Numerous combinations have been tested and published using cast lead bullets in straight walled rifle chambers. Reduced loads for standard rifle calibers will be published soon. As with any propellant and load combination, a minor change to any of the components of the test load CAN result in significant shift in ballistic performance. This shift can cause unintended high pressures, and result in injury or death. Therefore, Shooters World LLC, nor the manufacturer of this propellant take no responsibility for the intentional or unintentional misuse of this product. The charge weights and results noted within are not recommended, either as a starting nor maximum load. They are shown merely as an indication of potential performance in one test load, shot by CIP standards.